Today’s announcement of this year’s increase in the living wage — to £9.75 an hour in London (previously £9.40) and £8.45 in the rest of the UK (£8.25) — will help the growing numbers benefiting from the fair pay benchmark. For a full-time worker it amounts to earning an extra £5,000 a year in the capital, and nearly £2,500 elsewhere, compared with a person on the government’s legal wage-floor (£7.20). That’s a big, life-changing difference. It’s a difference, though, that has been partially obscured, not least in the eyes of the media, by the recent rebranding of the minimum wage — reincarnated as the “national living wage”. Many assumed that the ensuing terminological muddle would result in the demise of the voluntary (real) living wage, in a case of death by imitation. Well, it hasn’t worked out that way. The number of living wage employers has doubled since George Osborne first announced his revamping of the minimum wage. That’s a tribute to the employers and campaigners involved. But we need to keep this success in perspective: 6 million workers get paid less than the benchmark. Why, though, are ever more companies signing up? Polls of employers reveal a mix of motives. For some, committing to the living wage is a symbolic act that helps make good on standard corporate mantras about the workforce being a prized asset. Others highlight the desire to aim higher than merely avoiding breaking the law. And, of course, many are simply attracted by the reputational halo-effect that surrounds the living wage. All are welcome. Yet something else is going on too. For a growing number of employers it is the start of a wider shift in their business model: away from viewing workers as a cheap and disposable commodity, and towards one which sees them as a resource that needs to be invested in. An unlikely example is the rethink underway at Walmart, the most iconic low-paying employer in the US. Its management eventually came to realise that acting on declining sales, dirty stores and disappearing customers required a motivated workforce. Pay levels were raised from rock-bottom, training boosted and predictability of working hours increased. It’s still early days, but customer satisfaction and sales have both risen too. It’s a tale with echoes in the UK. When Ikea decided to embrace the real living wage — resulting in a pay-rise for thousands of workers — it did so as part of a wider commitment to hours-security and workforce training. Likewise when the small but rapidly growing craft brewery BrewDog took the same step, not only did two-thirds of the staff get a pay rise but zero-hour contracts were ditched as well. The result? Staff turnover plummeted and employee satisfaction has soared. The scale of the change that some employers are embarking upon, together with the living wage’s greater coverage, brings with it new responsibility. Now, more than ever, it needs to be — and be seen to be — a robust and credible benchmark. That’s why the Living Wage Commission, created to oversee the rates, has reviewed the underlying methodology and the data on which it relies. Its view is that the benchmark must, above all else, tell employers and employees the minimum that needs to be paid if households are typically to reach an acceptable, if modest, standard of living. This means it must be rooted in an assessment of the cost of living as determined by the price of a basket of goods and services that the public itself deems to be essential. Consequently the contrasting methodologies that hitherto set the living wage rates in London and the rest of the UK have been aligned. When the price of this basket goes up, upward pressure on the living wage results. The corollary is that the living wage won’t be driven by other factors that people may be concerned about, such as wider trends in earnings or inequality. These technical but vital improvements occur at a time when the living wage campaign faces new challenges and opportunities. Over the coming year a spike in inflation, expected slower growth and Brexit uncertainty may make potential employers more cautious. Yet to dwell on the problems is to misjudge the moment. A diverse set of factors — concern over the “left behind” following the Brexit vote; a surge in unease about conditions at work following the Sports Direct scandal; the stunning success of the Fight for $15 movement across America; and, just possibly, the change in personnel in No 10 — suggest the campaign for fair pay may be moving with the tide. This isn’t vain hope. Whether it’s the bold decision of the Scottish government to pay all care workers the living wage, or that by the London mayor to expedite its coverage to all Transport for London’s sub-contractors, there is undoubtedly momentum. Across England a new generation of city mayors are about to be elected on a hazy if heartfelt agenda of “shared growth”. They, too, will need to be champions of fair pay. 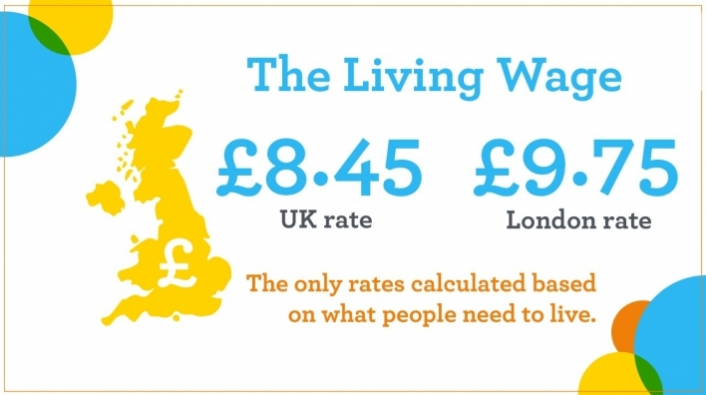 The calculation underpinning the living wage may be complicated but the moral intuition behind it is not. Building an economy that works for all requires reinforcing change on all manner of things from the welfare state to the fiscal stance. But policy alone won’t suffice. We also need to create a shared civic norm about what constitutes decent pay in the 21st century. On this, progress is being made.